Skoda is to offer a Virtual Cockpit in place of conventional dials on selected Octavia, Superb, Karoq and Kodiaq models. The system, which is already available on many Volkswagen and Audi models, uses a hi-res TFT screen which allows drivers to select from a choice of different displays where you'd normally find a rev counter and speedometer. In total, five different basic layouts are available - all available to have their appearance individually tuned. The classic layout presents both the tachometer and the speedometer as round instruments to the right and left of the display. 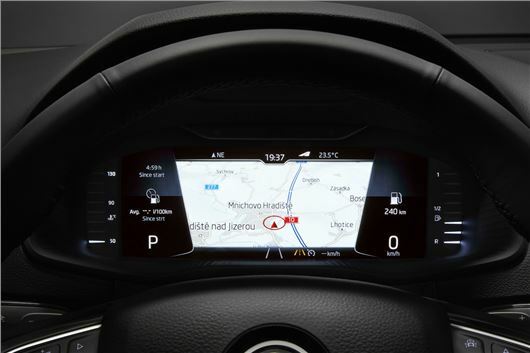 The area between can be configured – for example with a display of the current entertainment programme or navigation map, which also has a zoom function. The extended layout has a main display covering the entire width of the panel – for example with the current entertainment program or navigation map. Above and below, there is space for small digital displays, such as the current speed or traffic sign recognition. The modern layout has a large display in the centre, which can display the navigation map, among other things. Additional information can be placed to the left, right, and above the map. The basic layout shows two large displays – such as the current speed and the distance remaining. Additional basic information can be displayed at the top and bottom of the display. If the route guidance is activated, the navigation arrow will be displayed in the centre. Finally, the sports layout shows a single, centralised, large dial containing the speedometer and rev counter, with space for additional customisable information to be placed at either side of the dial. Virtual Cockpit is available to order as an option now on Octavia and Superb models from SE variants upwards at a cost of £450. The system also costs £450 on the Karoq, available from the SE L trim level upwards. The system will be available on the Kodiaq later in the year, costing £450 for SportLine, Edition and L&K variants and £550 when specified on SE L and Scout models.